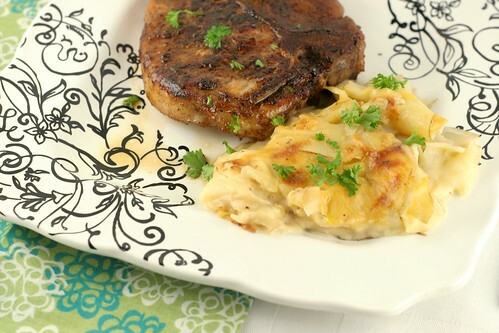 I have to admit, boxed au gratin potatoes are like the greatest thing ever. I've yet to have a homemade version that I like as much as the fake kind, which is sad. I thought about why they are so good and realized it must have to do with the thickness of the potatoes. I've made au gratin potatoes before by just chopping them up with a knife. This time, I used a mandolin to get paper thin slices and I think that really made the difference. I also made a traditional French Bechamel, or white sauce, which has a touch of nutmeg. It gets a grown-up kick with creamy blue cheese. I can hardly stand to look at that picture up there. Is there anything better than cheese and potatoes? I want to dive in a pool filled with potato gratin. The sauce I made has 2 tablespoons of butter with 2 tablespoons of flour. Melt the butter in a saucepan then add the flour until it forms a paste. This is the roux that will thicken the sauce. 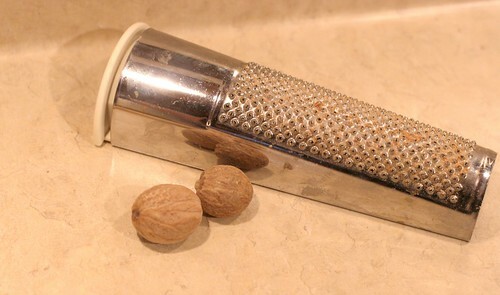 Add milk, salt, pepper and just a touch of fresh grated nutmeg. Whisk over medium heat until thick, then add blue cheese. Stir it while it melts and taste for seasoning. That's the best part. Make sure you wash your potatoes. I left the skins on, which I usually do when making potatoes. I like foods that are rustic and really look homemade. I ended up only using 3 potatoes for this. 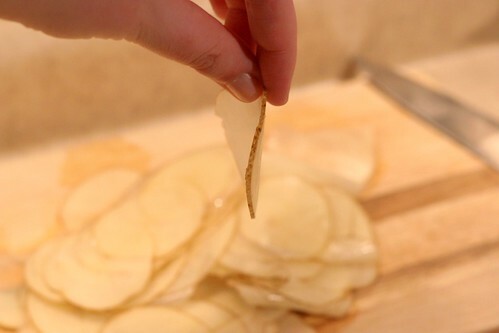 Use a mandolin slicer to create paper thin slices. Layer them in a greased baking dish. I layered the slices of one potato in the bottom of the dish and poured 1/3 of the white sauce over them. Then I added the slices of the second potato with 1/3 white sauce, and the same for the third potato. Now that you feel like a first grader, let's continue. It comes out of the oven looking cheesy and delicious. Michael and I decided these are definitely better than the boxed version. The nutmeg adds a touch of warmth, and blue cheese gives it a wonderful flavor. If blue cheese isn't your thing, add whatever cheese your heart desires. Or in my case, whatever cheese you have in the refrigerator. And if you're wondering what that beautiful hunk of meat is sitting next to those delicious potatoes... I totally understand. I made Barbecue Spice Rubbed Pork Chops, that recipe is coming up this week! Get excited. Melt butter in a medium saucepan over medium heat. Add flour and whisk until a paste is formed. This is the roux that will thicken the sauce. Add milk, salt, pepper and grated nutmeg. Whisk over medium heat until thick, about 3-5 minutes. Remove from heat and add blue cheese. Stir it while the cheese melts and taste for seasoning. Set the sauce aside. 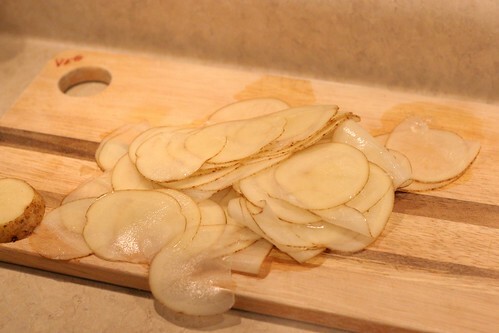 Wash potatoes and make paper thin slices with a mandolin, one potato at a time. 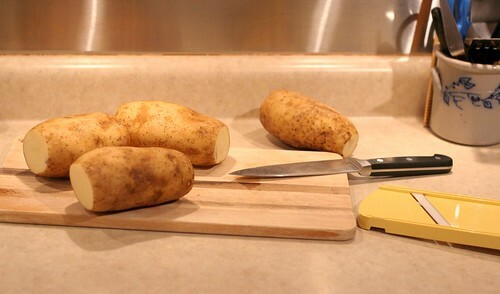 Each time a potato is sliced, layer those slices in your baking dish. Pour 1/3 of the sauce over first layer of potato slices. Repeat with remaining potatoes, using the remainder of the sauce to pour over top. Use a spoon to move the potatoes around a bit, to make sure the sauce sinks in. Bake covered for 30 minutes. Remove from oven and stir the potatoes around to make sure sauce is well incorporated. Bake uncovered another 30 minutes or until the top is golden brown. 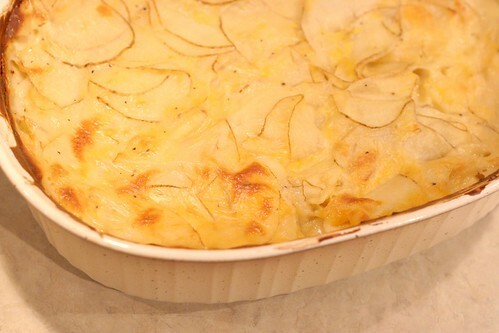 ahhhh beautiful dish - i loved potato au gratin in my prevegan days hehe. 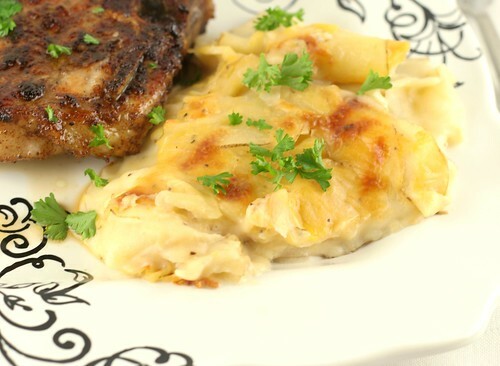 Yum, blue cheese in potato au gratin? That's genius. Plus, you have to love an excuse to use/buy a kitchen gadget as cool as a mandolin slicer. Looks absolutely heavenly! I could eat cheese and potatoes every single day! Love that yours has blue cheese in it!!! wow i would love to take a bath in that, if you know what i means ;P and blue cheese, just please, you're making my stomach growl at nearly 11 pm-totally cool girl btw :D oh and i AM excited for bbq pork chops mmm! So this is what happens when I read your blog at 8:20 in the morning...I am now desperately craving your blue cheese au gratin potatoes and will be obsessing about them all day!